Successfully Added Conquest S8 Rugged Phone 2017 Edition - IP68, External Walkie-Talkie Mic, 4G, SOS, Android 6.0, Octa-Core CPU, 1080p, 6000mAh to your Shopping Cart. 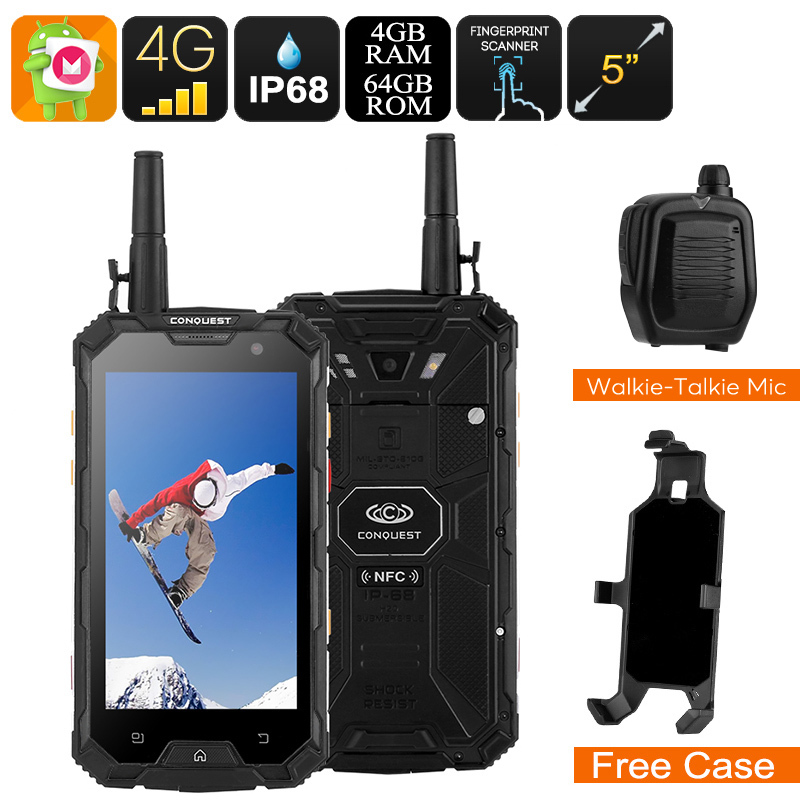 This rugged Android phone comes with an external walkie-talkie microphone. This brings along great convenience for when you’re trying to stay connected to fellow outdoorsmen while you’re out deep in the wild. The walkie-talkie features a 5KM range in 400 to 470HMz. Thanks to this; you’ll never lose contact to your fellow adventures in the area. Additionally, if supports an SOS feature that makes this the perfect outdoor companion. Along with its 6000mAh battery, it brings along enough juice to get you through multiple days of regular smartphone usage. Packed within its rugged body is a powerful Octa-Core CPU from MediaTek. Clocked at 1.8GHz, this processor brings along plenty of power. You’ll be able to tackle the latest Applications and software features without dropping a frame. Along with 4GB RAM, it furthermore lets you engage in demanding multitasking sessions. Whether you’re into games, movies, or Apps – nothing will slow this Android phone down. With access to Google Play, you can download the latest mobile media files for absolutely free. Whether you’re at home or outside, with this Android phone you’ll never have to experience boredom again. With 4G connectivity and WiFi, you’ll always be able to stay connected to the web. Browse the internet, stream movies, and make online calls. Nothing is impossible with this rugged phone. You’ll be treated with 64GB of internal storage and a 64GB SD card slot. This provides you with plenty of space to store all your media that can be enjoyed on the phone’s stunning 5-Inch display. By supporting 1080p resolution, this screen brings forth breathtaking visuals for you to enjoy anytime you turn on your Android phone.